Our range of products include engraving machines, 3d laser engraving machine, fiber laser engraving machine, laser engraver, jewellery hallmarking machine and laser engraving equipment. In order to keep pace with the ever-growing demand of our customers, Vision Embesoft Solution involved in offering a wide assortment of Fiber Laser Marking Machine. 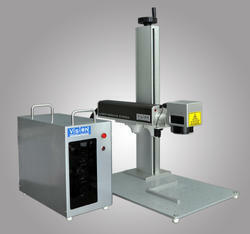 This Engraving Machines is extensively used in different industries. Engraving Machines product thoroughly tested on diverse parameters by our qualified quality controllers to dispatch a flawless range at the customer’s end. Our Engraving Machines is known for their robustness, efficient performance and long functionality. Our entire products ranges are highly acknowledged in the market. Engraving Machines offers a non-contact, abrasion-resistant, permanent laser marking onto almost any type of material. Engraving Machines process is Clean and Safe process –Chemical-proof, water-proof, oil, grease & fuel-proof. Engraving Machines is internationally Accepted as Quality Marking Standard. We are suppliers of assortment of 3D Laser Engraving Machine or Laser Engraver to our appreciated customers. This 3D Laser Engraving Machine is extensively demanded in different other industries. This 3D Laser Engraving Machine product is checked for quality under different parameters, which are set by th This p is designed by our trained professionals using latest techniques and premium quality material. Our product is available in reliable in nature, robust in construction and known for their long functional life. At Agile Machinery, we strive to deliver premium grade Fiber Laser Engraving Machine. We design and fabricate this machine using stainless steel and other basic materials with the aid of advanced technology. Offered machine finds usage in jewellery industry for engraving and hallmarking on different ornaments like bangles, necklace, pendants and earrings. The Fiber Laser Engraving Machine is high in demand among the clients owing to its high accuracy & efficiency, easy installation & maintenance, hassle-free operations, longer service life and low power consumption. Laser marking on Jewelry, Medical Instruments, Automotive, Consumer Goods, Electronics Parts and Giftware etc. Using Laser Marking, Clean, Plastic and Metal Surfaces. Fiber Laser Engraving Machine can be Engrave Deep or Fine. Fiber Laser Engraving Machine offers a non-contact, abrasion-resistant, permanent laser marking onto almost any type of material. Fiber Laser Engraving Machine is internationally Accepted as Quality Marking Standard. Capitalizing on our enormous industry experience, we come up with topnotch quality Laser Engraver. This machine is ideal for engraving on different mechanical instruments, automobile vehicles, jewelry items, hardware components and company logos. To cater to our clients' variegated demands, we offer this machine in different models and specifications. Vision Embesoft Solution is considered amongst well known organizations, we are engaged in manufacturing, supplying and exporting a large range of Jewellery Hallmarking Machine in Gandhinagar, Gujarat, India. These products are manufactured using high-grade raw material and latest technology machines. We provide this range at moderately prices. The Jewellery Laser Engraving Machine process is virtually all metals and plastics and various other materials with high contrast and without adding any undesirable substance. In most cases the typical physical effect of the laser marker induces a color change within the material so there is no surface modification by corrugations or burrs. Different laser marking methods and laser sources are used, to achieve the best results on every type of material. Laser marking is highly flexible process compared to any other marking process. 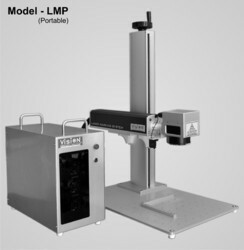 Laser marking machine can mark any images and fonts without changing any punch, die, stencil etc. unlike other conventional process. Jewellery Hallmarking Machine offers a non-contact, abrasion-resistant, permanent laser marking onto almost any type of material. Jewellery Hallmarking Machine process is Clean and Safe process –Chemical-proof, water-proof, oil, grease fuel-proof. Jewellery Hallmarking Machine is internationally Accepted as Quality Marking Standard. Jewellery Hallmarking Machine on Jewellery, Medical Instruments, Automotive, Consumer Goods, Electronics Parts and Giftware etc. In order to keep pace with the ever-growing demand of our customers, Vision Embesoft Solution involved in offering a wide assortment of Fiber Laser Marking Machine. This Laser Engraving Equipment is extensively used in different industries. Laser Engraving Equipment product thoroughly tested on diverse parameters by our qualified quality controllers to dispatch a flawless range at the customer’s end. Our Laser Engraving Equipment is known for their robustness, efficient performance and long functionality. Our entire products ranges are highly acknowledged in the market. Laser Engraving Equipment offers a non-contact, abrasion-resistant, permanent laser marking onto almost any type of material. Laser Engraving Equipment process is Clean and Safe process –Chemical-proof, water-proof, oil, grease & fuel-proof. Laser Engraving Equipment is internationally Accepted as Quality Marking Standard. In order to keep pace with the ever-growing demand of our customers, Vision Embesoft Solution involved in offering a wide assortment of Fiber Laser Marking Machine. This Desktop Laser Engraver is extensively used in different industries. Desktop Laser Engraver product thoroughly tested on diverse parameters by our qualified quality controllers to dispatch a flawless range at the customer’s end. Our Desktop Laser Engraver is known for their robustness, efficient performance and long functionality. Our entire products ranges are highly acknowledged in the market. Desktop Laser Engraver offers a non-contact, abrasion-resistant, permanent laser marking onto almost any type of material. Desktop Laser Engraver process is Clean and Safe process –Chemical-proof, water-proof, oil, grease & fuel-proof. Desktop Laser Engraver is internationally Accepted as Quality Marking Standard. In order to keep pace with the ever-growing demand of our customers, Vision Embesoft Solution involved in offering a wide assortment of Fiber Laser Marking Machine. This Desktop Engraver is extensively used in different industries. Desktop Engraver product thoroughly tested on diverse parameters by our qualified quality controllers to dispatch a flawless range at the customer’s end. Our Desktop Engraver is known for their robustness, efficient performance and long functionality. Our entire products ranges are highly acknowledged in the market. Desktop Engraver offers a non-contact, abrasion-resistant, permanent laser marking onto almost any type of material. Desktop Engraver process is Clean and Safe process –Chemical-proof, water-proof, oil, grease & fuel-proof. Desktop Engraver is internationally Accepted as Quality Marking Standard.